Admirable Women – Phyllis Schlafly Fights For Motherhood | It's the Women, Not the Men! Mrs. Schlafly is the mother of six children, a constitutional lawyer, founder of the Eagle Forum and a conservative activist. She was an outspoken opponent of the Equal Rights Amendment to the U. S. Constitution during the 1970s. Phyllis testified before many U. S. Senate Commissions and Hearings on the issue. She is credited with its defeat, and by association, the defeat of the radical, second-wave feminists who supported its adoption. 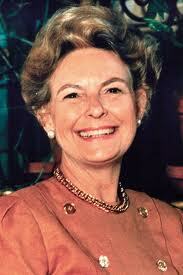 Mrs. Schlafly has been an outspoken opponent of radical feminism throughout her illustrious career. Through her extensive research she has concluded that radical, second-wave feminism is principally based on lesbian ideology. She writes that it purportedly seeks a “gender-neutral” society, when in fact, it is determined to destroyed the concept of motherhood and replace it with career women. Phyllis believes this effort, to trivialize the enormous value and contributions of stay-at-home mothers to our society, while at the same time glorifying the career-oriented women solely because one gets a paycheck and the other does not, is ludicrous. Phyllis believes that stay-at-home mothers, who take full responsibility for raising their many children to become responsible, productive and honest members of society, contribute far more to the future of the society that the average, single, female co-worker. I agree, there is no comparison! One results in an egocentric, faithless, selfish, loveless, lonely, materialistic and depleted “feminist lifestyle.” The other results in a faith-filled life, wrapped in joy and happiness, based on love, marriage, commitment, family, children, and contentment, which statistics also show, provide the best opportunity for wealth, good health and longevity. Only young, naive, susceptible, gullible women could be brainwashed, during their 4-6 year attendance at college, into choosing the former. And this ridiculousness has only been possible because Women’s Studies professors, and their lesbian and socialist campus cohorts, have been working diligently for 45 years to eradicate any opposing opinions to their preposterous premise, while at the same time, deliberately deriding stay-at-home mothers through every campus venue available. “What greater thing is there for two human souls, than to feel that they are joined for life — to strengthen each other in all labor, to rest on each other in all sorrow, to minister to each other in all pain, to be one with each other in silent unspeakable memories at the moment of the last parting?” 1859 by (Mary Anne Evans, whose pen name was) George Eliot. I believe there is but one choice. I admire Mrs. Phyllis Schlafly for her determination, her consistency and her courage to fight the onslaught of radical, second-wave feminism for most of her long life. She is truly an admirable woman, and fortunately for today’s young women, her legacy will continue through her niece and author Suzanne Venker, who is following in her footsteps. Thankfully, there will continue to be a voice of reason, in Mrs. Schlafly’s absence. Bravo! I’ ve been giving your beliefs a great deal of thought, one of them being that this second wave is all lesbian, yet could not say this out loud. I must make clear, that I do not have a problem with the gay community at all. I have many close friends in this community and they live strong, Christian lives. Like any other group there are the loud, way too outspoken, fearful, hypocrites, who speak only too feed their own egos and hide their deep seated self esteem issues. It now takes a great deal of courage to chose to be a stay at home Mom and indeed, this generations entitlement complex is the result of 2 parent working homes and their guilty need to attempt to buy their children’s love. Thank you for being un-afraid. I know people in the gay community too and most of them are in therapy and, will admit privately, that they are far from “gay.” The term is wrapped in “political correctness” which is the smoke screen invented by radical, second-wave lesbian feminists to cover the irrationality of their views. The Bible warns people to avoid a life that is defined solely by self-centered sexuality, and this warning applies to both straight people and homosexuals. It is an unhappy, unbalanced life and thereby unfulfilling. It’s too bad more don’t heed it’s warning because their lives would be much less fraught with pain. And on your second point, you are right. Radical, second-wave feminism has caused women to become very conflicted, primarily by demanding that others care for their children. This unrealistic demand has caused a lot of unnecessary controversy and animosity, even between the parents themselves. If a woman wants children she should be willing to revive her Christian faith, marry and then to care for her children herself, full-time, because that’s the only proven way to raise good kids. All the toys in the world will never replace a mother’s love, time and attention. No one will ever love her children the way she does. And if she believes otherwise and absorbs the feminist BS, she will be very disappointed in the end, because neglected children make for miserable adults. Thanks for your comment.